Pt BD Sharma Post Graduate Institute of Medical Sciences, Rohtak, India. *Address correspondence and reprints request to: Ranjita Bains, Pt BD Sharma Post Graduate Institute of Medical Sciences, Rohtak, India. Dahiya P, Bains R. Conservative Management of Fetus Papyraceus: A Report of Two Cases. Oman Med J 2014 Mar; 29(2):132-134. The term fetus papyraceus is used to describe a mummified fetus associated with multiple gestations where one fetus dies and is flattened between the membranes of living fetus and uterine wall. Though the maternal and fetal complications in affected cases can be severe, we report of two cases of fetus papyraceus managed conservatively without any complications. Successful outcome is related to careful monitoring during pregnancy. 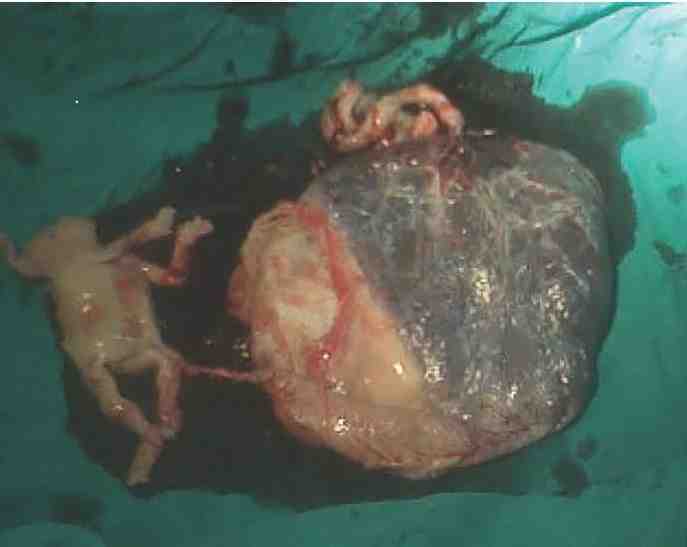 Keywords: Twin pregnancy; Intra-uterine death; Term gestation. Multiple gestations have become one of the most common high-risk conditions encountered by practicing obstetricians. Twins represent approximately 3% of all live births.1 Triplets and higher-order births, according to the Hellin-Zeleny hypothesis, have increased 470% and triplets now occur with a frequency approaching 1 in every 500 deliveries.2 Multiple births result in 17% of all preterm births less than 37 weeks and 26% of all very low birth-weight (<1,500 g) infants and are at an approximate 7-fold greater risk of dying before their first birthday compared with singletons.2 The term fetus papyraceus is used when intrauterine fetal demise of a twin early in pregnancy occurs, with retention of the fetus for a minimum of 10 weeks resulting in mechanical compression of the small fetus such that it resembles parchment paper.3 Being a rare complication, the incidence of fetus papyraceous has been reported at 1 in 12,000 pregnancy,4 and ranges between 1:184 and 1:200 twin pregnancies.5 We present two case reports on fetus papyraceus managed conservatively. A G2P1, 24-year-old was referred from a remote area at 31 weeks of gestation in view of twin pregnancy. The presenting complaints were a history of blood stained vaginal discharge on and off for 2-3 weeks. An ultrasound was done and she was diagnosed to have a twin pregnancy with one IUD. General physical examination revealed mild pallor and pedal edema. Obstetric examination revealed fundal height corresponding to 30 weeks, single fetus with cephalic presentation with fetal heart rate of 140 per minute. On ultrasound, she had a monochorionic-diamniotic twin pregnancy of 28 weeks gestation. The second fetus was dead with a gestational age of 17 weeks. The patient’s attendants were counseled about the patient’s condition and risks to mother and fetus were explained on the continuation of pregnancy. She was managed conservatively with monitoring of coagulation profile every fortnight and sonography every three weeks. At 39+4 weeks, she had spontaneous onset of labor and delivered a healthy male baby weighing 2.8 kg. The other fetus was found enveloped in amniotic membranes flattened along the placenta. The crown rump length of this fetus papyraceus was 8 cm and weighed 150 grams (Fig.1). The normal baby was kept under follow-up over the next one year to assess any developmental delay. A 23-year-old primigravida presented to us in labor at 38+6 weeks gestation. She had a normal antenatal course with a history of excessive nausea and vomiting during the first trimester. Her hemoglobin was 10 g% with B Rh positive blood group. All other investigations were normal. She had a sonograph at 22 weeks of gestation showing twin gestation with one viable fetus BPD-53 mm, FL-37 mm, maturity of 22 weeks, and a non-viable fetus with absent cardiac activity with an FL-24 mm, maturity of 16 weeks; single placenta anterior in upper uterine segment; and no gross malformations in the viable fetus. Abdominal examination revealed a term size uterus with cephalic (2/5) presentation with fetal heart rate of 136/ minute with good uterine contractions. She delivered a baby boy of 2.5 kg within 2 hours of admission. A single placenta was delivered with 2 cords and careful examination revealed a calcification on one side of the placenta. 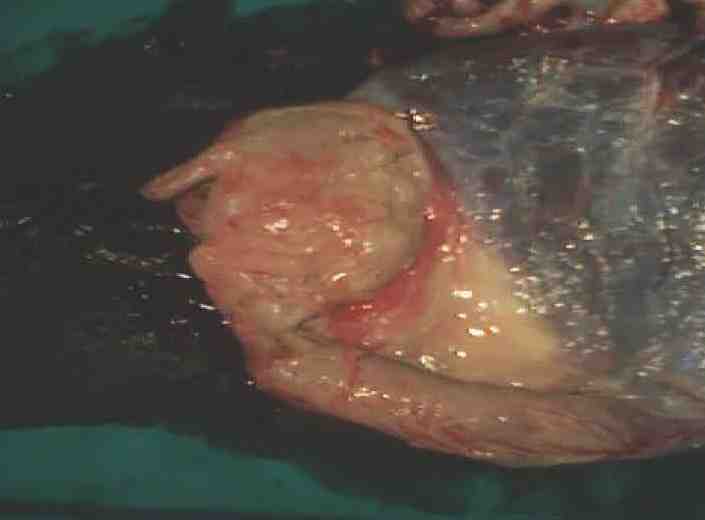 It was identified as diamniotic-monochorionic placenta with a fetus papyraceous in the layers of placenta (Fig. 2 and 3). 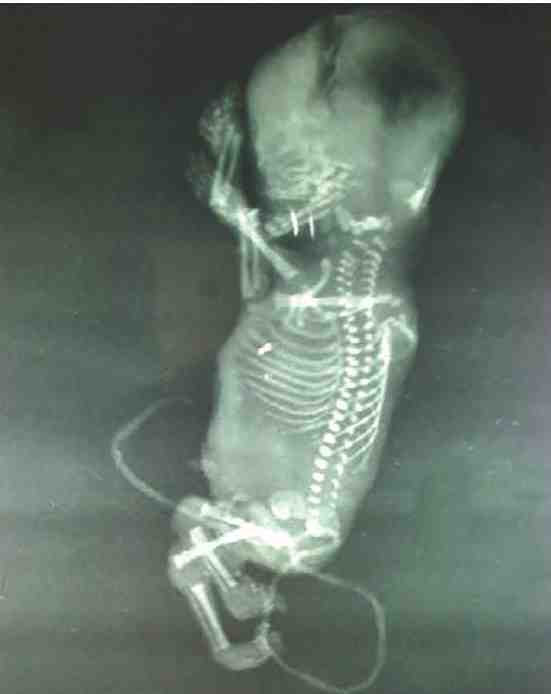 Figure 1: Radiological image of fetus papyraceus. Figure 2: Fetus papyraceus compressed in placenta. Figure 3: Diamniotic-monochorionic placenta with fetus papyraceus. Monochorionic twin pregnancies exhibit increased complication rates such as the risk of preterm birth and increased maternal risks. They are at higher risk of specific complications which include twin-to-twin transfusion syndrome (TTTS), fetus in fetu,6 selective intrauterine growth restriction (IUGR), death of one twin, and twin reversed arterial perfusion (TRAP) sequence.7,8 In monochorionic pregnancies, single IUFD poses a significant risk of perinatal mortality and serious neurological impairment to the surviving co-twin.9 Congenital anomalies like intestinal atresia, gastroschisis, absent ear, aplasia cutis, central nervous system damage and anomalies of the heart have been reported.10,11 Single fetal death in a monochorionic pregnancy should be referred and assessed in a regional fetal medicine center.12 Neonatal cranial ultrasound is recommended after delivery. Serious compromise in the surviving fetus may be anticipated and this should be discussed with parents.12 Fetal magnetic resonance imaging provides more detailed information about brain lesions in the surviving fetus and its use is recommended.13 However, in many cases of fetus papyraceus, there are no complications to the mother or to the surviving twin, as described in the two cases presented here. Antepartum diagnosis of fetus papyraceus is infrequent and it is usually an incidental finding during investigation of some other pregnancy problems. No correlation to maternal age, parity or gravidity with fetus papyraceus has been discovered.14 Expectant management with close maternal and fetal surveillance is advised. The primary concern of fetus papyraceus is its effect on the surviving fetus and on the mother. To avoid the possible complications, the intrauterine diagnosis of fetus papyraceus by serial ultrasound examinations is a must and conservative management in the form of careful monitoring for better maternal and neonatal outcome is critical. 1. Martin JA, Hamilton BE, Sutton PD, Ventura SJ, Menacher F, Kirmeyer S. Births: Final Data for 2004. National Vital Statistics Report. Vol 55. No 1. Atlanta, GA: Centers for Disease Control and Prevention; 2005. 3. Dickey RP, Taylor SN, Lu PY, Sartor BM, Storment JM, Rye PH, et al. Spontaneous reduction of multiple pregnancy: incidence and effect on outcome. Am J Obstet Gynecol 2002 Jan;186(1):77-83. 4. Rathi BA, Rathi SM. Fetus papyraceous - a case report. J Obstet Gynaecol India 2003;53:188. 5. Woo HH, Sin SY, Tang LC. Single foetal death in twin pregnancies: review of the maternal and neonatal outcomes and management. Hong Kong Med J 2000 Sep;6(3):293-300. 6. Murtaza A, Kanhaiya C, Mahore S, Maimoon S. Fetus in Fetu: A Rare Presentation in an Adult Female. OMJ 2010;25. 7. Hack KE, Derks JB, Elias SG, Franx A, Roos EJ, Voerman SK, et al. Increased perinatal mortality and morbidity in monochorionic versus dichorionic twin pregnancies: clinical implications of a large Dutch cohort study. BJOG 2008 Jan;115(1):58-67.
twin pregnancies. Oman Med J 2013 May;28(3):173-177. 9. Fusi L, Gordon H. Twin pregnancy complicated by single intrauterine death. Problems and outcome with conservative management. Br J Obstet Gynaecol 1990 Jun;97(6):511-516. 10. Mittal P, Khanna M. Two papyraceous fetuses in a triplet pregnancy. J Obstet Gynaecol India 2007;57:77-78. 11. Upadhyaya I, Pradhan M, Sharma R. Twin pregnancy with fetus papyraceous. JNMA J Nepal Med Assoc 2009 Jul-Sep;48(175):246-248. 12. The Royal College Obstetrician and Gynaecologists, Green-top Guideline Management of Monochorionic Twin Pregnancy, Green-top 51, December 2008. 13. Righini A, Salmona S, Bianchini E, Zirpoli S, Moschetta M, Kustermann A, et al. Prenatal magnetic resonance imaging evaluation of ischemic brain lesions in the survivors of monochorionic twin pregnancies: report of 3 cases. J Comput Assist Tomogr 2004 Jan-Feb;28(1):87-92. 14. Daw E. Fetus papyraceus–11 cases. Postgrad Med J 1983 Sep;59(695):598-600.